There's a lot riding on PlayStation VR as the mainstream champion of virtual reality. Though it arrived half a year later than the Oculus Rift and HTC Vive, the fact there were already almost 50 million PS4 consoles in people's living room (and now just over that number) meant it had a distinct advantage. How many people do you know who could afford more to drop than $1,000 on a PC and high-end headset? How many people do you know who could afford a PS VR? Exactly. But that also means it will be most people's introduction to 'good' VR. With compromises made on the hardware to achieve that price, PlayStation VR is not perfect, but it's going after console gamers hard and ultimately, it is still a truly awesome PS4 accessory. What's more, now five months since launch, the library is much stronger with some must-have titles that feel like complete games, not merely demos to showcase the potential of this technology. Oh yeah, and all of this seems to be paying off nicely when you look at how well the system is selling. Right now, the HTC Vive still stands as the benchmark of high-end VR, although the Oculus Rift is barely trailing behind, and is set to have some pretty fantastic games later this year. PlayStation VR is mainstream VR right now - so is it worth jumping in? Sony has found a good balance in terms of keeping the PS VR practical and accessible; it's maybe not as plug-and-play as we'd like, but it's a darn sight easier to put together than the Vive. Just set up your PlayStation Camera first – this is sold separately but required to play, not an extra like the Move controllers – then follow the instructions to connect all the correct cables from the Processor Unit to your PS4. The main thing to remember is that this box becomes a pass-through for your HDMIs – one goes from the TV into the unit, another from the unit to the PS4. One small niggle: this does affect HDR performance on your TV, so you'll want to switch it off when you're done with the headset. 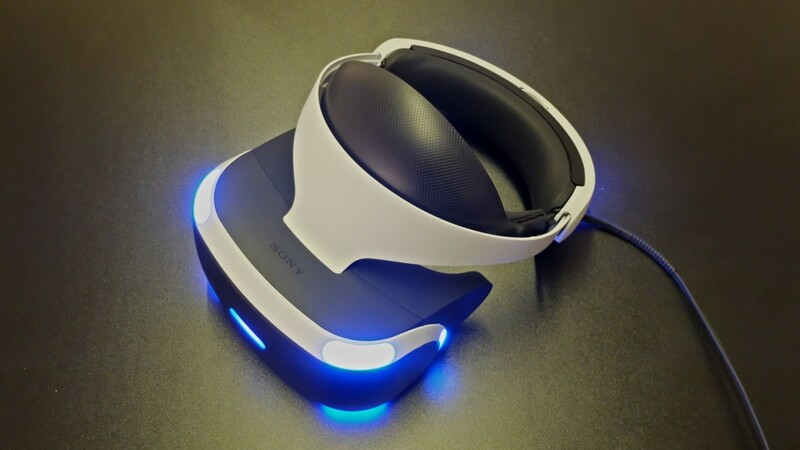 Then you connect the headset itself to the Processor Unit – we'd recommend going with the longer cable here so you can turn around comfortably – and power on the PlayStation VR via the in-line controls, which also include volume and mic buttons. That's pretty much it, and while we've perhaps made it sound easy, there are still a lot of cables to manage. If you're a little precious about having no wires in the living room, it's tricky to make everything look neat. However, because it doesn't use the same play space as the Vive, you probably won't be moving much furniture around, if any, to make room for the PS VR. There's no room mapping needed, you just need to tinker with the Camera to line it up with your head and make sure there's nothing in swinging distance for you to break. Sony recommends playing PS VR seated rather than standing, sitting five feet from the Camera with enough room on either side for you to lunge/duck/turn. It helps if your PS4 is close to your TV as the standard PlayStation Camera wire is pretty short and this needs to both hook up to your console and be able to see your face. All in all, setup is reasonably straightforward, and a few months on, we've had few reasons to disconnect any of the kit. As we said, you can turn off the Processor Unit without disconnecting any wires, so there's no reason to unplug PS VR once it's all set up. You always know where you are with the menus – once you've downloaded some VR games (which can take a while) they just appear in your regular PS4 menu for you to select. This appears in VR too using PlayStation's Cinematic Mode – it's a 2D screen floating in blank 3D space and you can press the PS button on your DualShock to quit apps and games and get back to it at any time, which is reassuring. The PS VR's blue lights don't just act as tracking points so the camera can follow your head around, but they make the headset look damn nice too. It's also comfortable; the plastic head strap distributed the weight more evenly than the Vive and Rift, while the padded crown section on your forehead makes sure it remains comfortable when in place. Once it's on, it feels very light, even at 610g. Even after an hour of Job Simulator, it should still be comfortable on your head, and with longer games like Resident Evil 7 this comfort is an essential requirement. There's no pass-through camera to see what's going on in the real world but there is a super handy button on the bottom of the headset that slides the screen back and forth to get a secure fit, or to check the whereabouts of your cat. The headset's tether tends to get in the way less than the Vive, especially as you won't be moving about as much, but still be careful that you don't end up yanking the PS4 from under your TV with any extreme movements - or at least be sure to have the extension wire in. In our few months of using it, there have been a handful of times where we've pulled the Processor Unit out by mistake. There are some flaws with the design. The plastic strap helps with the weight, but it can be a little tricking to get on and off, even with the button and dial to loosen the head band. Be careful to not catch your hair (if you have it) when you pull it off by not extending the band enough. The rubber sections around your face, and particularly to the sides, feel flimsy and don't give you that secure feeling of being enclosed as with the cushioned Vive or even a Gear VR. Essentially, even though they don't let any light in, if you bash the side by accident during a game, say, it can flex and let some of the world around in which is exactly what you don't want. It can be slightly distracting, and sometimes a little sweaty. Then there's the fog. We've found ourselves wiping down the lenses quite a few times in our months of using the PS VR. Granted, this is a problem shared by all virtual reality headsets, but the PS VR is more susceptible than some of the ones we've tried. Not a dealbreaker, but not ideal. While PlayStation VR lacks some things of its PC counterparts, its display, a single 5.7-inch 1920 x 1080 OLED, is mighty impressive. Both the Rift and Vive have two displays a-piece and what we have here on the PS VR is a similar size to a Note phone in a Gear VR, but it looks very sharp thanks to the RGB tech with 3 sub-pixels per pixel. That actually makes it harder to notice the lines between each pixel than on the Rift and Vive, with a less noticeable screen door effect, although it still pops up from time to time. Its 100 degree field of view is slightly smaller than Rift or Vive (and some mobile VR headsets now), however, but the PS VR has a refresh rate of (up to) 90Hz, or even 120Hz using its 'reprojection' tech. The VR worlds you'll explore look rich, vibrant and immersive on the display and as Sony boasts, we encountered very little visible lag in the images thanks to its less than 18ms latency. Of course, some of this will come down to the games themselves. We should also say that if you've been spoiled by Vive, you'll probably notice the difference in quality, but the truth is that many people haven't used Vive yet and/or can't afford it, and the gap between the Vive/Rift and PS VR is small enough that this will be good enough to impress most. After several months of using it alongside the other headsets, we still feel like this is the case. So it's not the most mindblowing VR headset display but, combined with the larger library of games now available, it's more than good enough to help you feel like you've taken a proper leap into virtual reality. This is not a VR system built for lots of physical input, and that's okay. If you're happy sitting down and getting the thrill of moving your head, ducking and turning round to shoot in different directions, then you are well served here. The 1:1 head tracking by the PlayStation Camera is good when you're correctly positioned and, in games where you can see the DualShock as an animation in VR (like Tumble VR), micro movements are tracked well. When we first reviewed the PS VR we were using the now-outdated PlayStation Camera, and it works, but we'd recommend getting the upgraded model with the tiltable stand. It will save you a lot of faff. As we said, the tracking is good when you're correctly positioned, and one of the PS VR's annoying flaws is that this tech isn't as forgiving as we'd like. The camera has a limited viewing angle, and things also get dicey when you turn your head and it has to track the back of the headset. We've also had a few instances in our extended time with PS VR of the motion controllers going AWOL when the tracking has come unstuck. Really, we'd like to see Sony deliver a tracking system that doesn't throw us outside of the play area so often. If you're in a game and the perspective goes awry you can hold down 'options' on a DualShock to recalibrate your view, which is quick and works like a charm. However if you switch players of different heights or fancy standing up, you'll also have to recalibrate the Camera which quickly becomes annoying and is hard to do with just one person. A real plus point for the PlayStation VR is that you can just play with your DualShock controller that you already own (thus saving money), but you'll want to get some Move motion controllers to take advantage of everything PS VR has to offer. If you don't already own the Moves, you can buy the new redesigned, rebranded stick controllers either in a bundle or separately. There's a lot of freedom and the PS VR Aim controller – the gun shaped one which will work with upcoming sci-fi game Farpoint – will join the options soon enough too. Generally, the PlayStation Camera tracked the Move controllers well enough, but like we said, just make sure your setup is tight. In some games, the two hand controls really make it – reloading guns, holding open the hood of a car with one hand while you tinker around inside etc. They aren't as intuitively designed as Oculus Touch and don't have finger tracking but they're smaller, lighter and less unwieldy than Vive's controllers. By pressing 'start' you can recalibrate your view but we often find ourselves using the DualShock to navigate menus until we actually got into the game. But as we write this a few months after launch, we'd like to see more games using the Move controllers over the DualShock gamepad. For some games it makes sense to go for a more traditional controller, we get that, but as the HTC Vive and now the Oculus Rift are proving, the future of VR lies in motion controls. Hopefully, we'll see some great new ideas unveiled at E3 2017. As the PS VR Aim shows, the VR peripheral market for PlayStation VR could be huge, and it's something HTC is trying to do with its Vive Trackers. We also wouldn't be surprised to see more from Sony; the Move controllers weren't built from the ground up for VR but for now they do a decent – if not perfect – job. We can't ignore motion sickness on the PlayStation VR, and even after several months of using it, it's still a problem that occasionally rears its head. It's particularly been highlighted when showing off games to friends, and it's easy to tell which games are more likely to cause it. Driveclub VR is a prime suspect, as are generally the games that involve high velocity - especially if they don't look up to scratch. We've had a few bouts of mild motion sickness with the PS VR; more so than with more expensive headsets like Vive. It does tend to depend on the person too. Various members of the team experienced some nausea ranging from barely noticeable to on the verge of actually throwing up when playing for over an hour. Sony says to take a 15 minute break after an hour and we strongly advise sticking to this, no matter how tempting it is not to. In slower games, and ones with a static viewpoint like Job Simulator, it's much less of a problem, but still keep an eye out for headaches and eye strain. Again, regular breaks are strongly advised. Before launch, Sony made a big deal about how many developers it had working on PS VR titles, and now five months down the road there's a good handful of must-play games for Sony's virtual reality system. Resident Evil 7 made a big splash when it arrived earlier in 2017, not just because it's a great back-to-roots sequel in its own right, but because it can be played from start to finish with PS VR. Our review? Spooky as hell, but the visuals do take a hit, and some people have found it to be a nauseating experience (and not because of the gore). But the fact that there's a full-length game with a name as big as Resident Evil's stamped on it is good news for PS VR. Other current favourites include I Expect You To Die, an escape the room puzzler; Psychonauts in the Rhombus of Ruin; and Battlezone. There are some exciting games around the corner too, including Star Trek: Bridge Crew, which promises good things for multiplayer, but if games were the thing holding you back from buying a PS VR at launch, fear no longer. Speaking of multiplayer, we're starting to see more cross play with other VR systems. EVE: Valkyrie will now let you take on Rift and Vive, while Ubisoft also brought the support in Eagle Flight, and promises future games, including Star Trek: Bridge Crew, will have the same. Another bonus is the PS VR's social and sharing features both in the form of capturing your VR gameplay (it takes the right eye view) and livestreaming to the likes of Twitch. It's something that Sony has promised to build on too, particularly with bringing in other non-headset wearing players in the room. For now, the PS VR is probably still missing that one, great 'killer app', but there are some highly recommended games, and given it's only five months old that feels good to say. Sony's VR system is off to a great start, and we just hope it keeps its full weight behind it through 2017 and beyond. E3 is sure to bring some surprises, and Sony has every chance of making this the year it dominated virtual reality. The PlayStation VR is virtual reality's big hope to go mainstream, and with some great games now on the system it's even easier to recommend it. Yes, there are some limitations in the tracking tech when put up against the Vive, but if you already have a PS4 then you're still getting an experience that's comparable in quality for much less money. It's practical, comfortable, and boasts a growing library of longer-play titles.